“Population Health Management” has become the buzz phrase in health care today where it is being used by providers, integrated health care systems, Patient Centered Medical Homes, ACO’s, payors and many others as the system begins to transform from a fee for service approach to one based on outcomes. Implementing systems based upon these principles can go a long way to fixing our health care system. The Population Health Alliance, a non-profit association which represents 80 plus companies, is an organization whose mission is to advance the principles of population health. The PHA’s members have spent a lot of time through the organizations Quality and Research Committee developing tools and papers to help organizations as they move into this space. 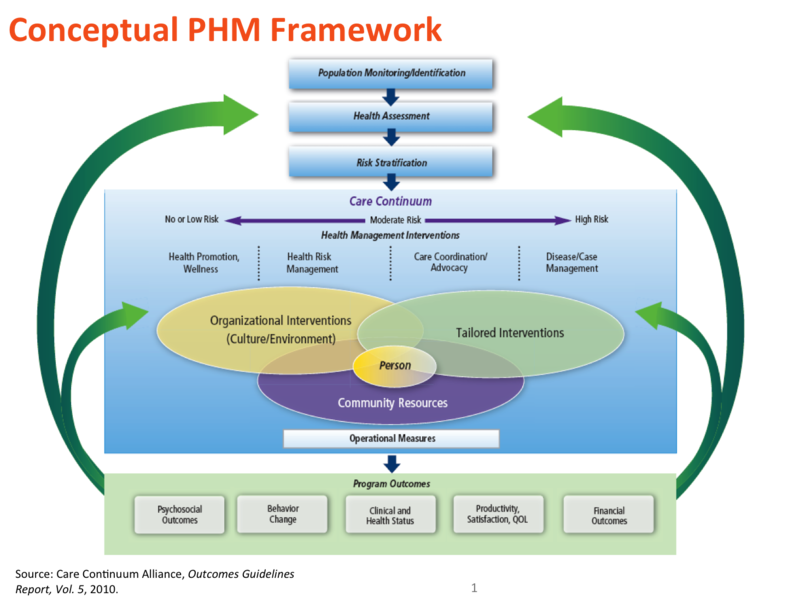 Below is a conceptual framework for Population Health Management from the PHA Outcomes Guidelines report. Note that it begins with population identification, assessment and risk stratification; and moves on to providing a full complement of services in a person centered model via organizational and tailored interventions along with community resources. It also recognizes that these services are available to the person no matter where they are in the continuum of care and that the last piece requires the measurement of outcomes in a multitude of areas which are used to create a feedback loop. do in fact identify issues and risks that many individuals were unaware of. Such as the millions of people in the United States who are pre-diabetic but don’t know it, many of them could be identified through a relatively inexpensive screening program. Let me be also be clear that doing an HRA and biometric screenings alone, or even as part of a minimal program, does not a successful wellness program make, it really must be part of a larger organizational effort to create a culture of health. To learn more about the Population Health Alliance, please reach out to me or the organization, and if you are looking to implement population health management programs, services or are a vendor in this space, I’d be happy to discuss your specific needs. Next I’ll be discussing the recently released Screening Guidelines that were just published as a joint effort of the American College of Occupational and Environmental Medicine (ACOEM), the Health Enhancement Research Organization (HERO) and the Population Health Alliance.